COOK TIME WITH REMMI - Mom Made That! 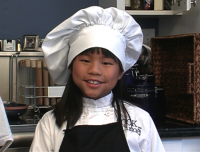 COOK TIME WITH REMMI is a kids’ cooking show, hosted by kids! Star Cook Remmi shows everyone how to make a healthy, yet simple meal in 30 minutes or less! Plus, each meal costs less than what you would spend going out- about $3 per person! Remmi realized that 43% of family meals are eaten out, which is an alarming number! Did you know that more than 18% of kids in America are either overweight, obese, or at risk; and a third of kids under the age of 18 are also at risk of Type II Diabetes? This means that most overweight or obese children will become overweight or obese adults. 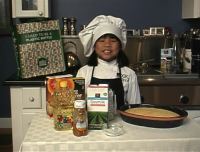 Therefore, young chef Remmi wanted to link healthy eating to cooking. What better way to encourage kids to eat healthier than to have kids teach other kids how fun it can be in the kitchen? Remmi likes to think of it as being a Food Scientist in her own Food Lab by coming up with a variety of delicious and easy meals for everyone to make. On her show, she always makes a main dish, a side dish, and a salad. And, with the help from the Cook Time Team, you’ll be able to learn some Fun Food Facts along the way! Cook Time with Remmi also has its own website where you can find the show, recipes, how to Go Green, and lots of other fun stuff! There is also a really cool and fun Star Membership Club you can join! Check it out at www.cooktimewithremmi.com.